Like its Snapdragon sibling, the Exynos version sports a 6.4” 1440p AMOLED display, 6GB of RAM, dual 12MP rear cameras, and a 4,000mAh battery. The model on sale is compatible with T-Mobile and AT&T networks in the U.S. and comes in four flavors: metallic copper, lavender purple, ocean blue, and midnight black. 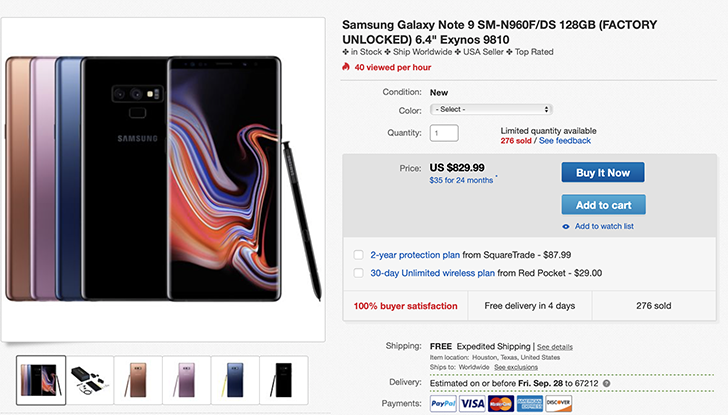 This particular listing indicates that the item will ship from Houston, making it a great option for U.S. customers looking for a Note9 deal. If you’re using a carrier other than AT&T or T-Mobile, make sure yours is supported by referencing the band specifications on the listing page.